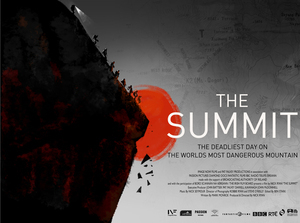 The Summit, an Irish feature length documentary, produced and directed by Nick Ryan (Image Now Films) about the deadliest day in modern mountain climbing history, has been selected to screen in competition at the Sundance International Film Festival in January 2013. The Summit was also nominated for a prestigious Grierson Award for Best Documentary at this year’s London Film Festival. Co-funded by RTÉ and the BAI, the Film Board and BBC. Posted in Misc and tagged The Summit at 4:29 pm on November 29, 2012 by Broadsheet.